Additive Manufacturing (AM) commonly known as 3D printing, is the integration of computer-aided design, material processing and forming technology Based on digital model files, through software and numerical control system will be dedicated metal materials, non-metallic materials and medical biological materials, according to Extrusion, sintering, melting, light curing, spraying, etc. layer by layer accumulation, to create the physical items manufacturing technology. Relative to the traditional, raw material. Material removal – cutting, assembly of the processing mode is different, is a “bottom-up” through the material accumulation of manufacturing methods, from scratch. That makes it. In the past by the traditional way of manufacturing constraints, and can not achieve the complex structural parts made possible. For nearly two decades, AM technology has developed rapidly, “Rapid Prototyping”, “3D Printing”, Solid Free-form Fabrication “, respectively, from different aspects of expression. The material manufacturing technology refers to the science and technology system which directly drives the parts by the three-dimensional data of the parts based on the discrete-stacking principle. Based on different, Classification principles and understanding of the way, there are rapid prototyping manufacturing technology, rapid prototyping, rapid manufacturing, 3D printing and other titles, its connotation still in the deepening of the extension is also expanding, where the so-called “increased material manufacturing” and “rapid prototyping”, “rapid manufacturing” the same meaning. Some people also called, SLA additive manufacturing. First, the control of material unit technology. It is difficult to control the physical and chemical changes in the material unit during the accumulation process, such as metal straight. In the molding process, the size of the tiny melting pool of the laser melting and the control of the outside atmosphere directly affect the manufacturing precision and the part performance. Second, the equipment re-coating technology. The automated coating of the material is the necessary process for the accumulation of the material. The process of the re-coating is directly determined. The accuracy and quality of the parts in the cumulative direction. Layered thickness to 0.01mm development, control the smaller layer thickness and its stability is to improve the accuracy of parts and reduce the surface roughness of the key. Third, efficient manufacturing technology. In the manufacture of large-size component manufacturing technology, such as metal laser direct manufacture of titanium alloy aircraft Frame structure, frame length of up to 6m, the production time is too long, how to achieve multi-laser beam synchronous manufacturing, improve manufacturing efficiency, to ensure that Synchronic reinforcement of the organization between the organization and the combination of regional quality is difficult to develop. In addition, in order to improve the efficiency, the combination of the material manufacturing and the traditional cutting manufacturing, the development of materials accumulated manufacturing and material removal manufacturing composite manufacturing technology. The method is also the development direction and the key technology. Additive Manufacturing technology does not require the traditional tool and fixture and multi-channel processing, in a device can be quickly and accurately create any complex shape of the zero Pieces, thus realizing the parts “free manufacturing”, to solve the formation of many complex structural parts, and greatly reduce the processing steps, shortening the plus Work cycle. And the more complex the product structure, the more obvious the role of manufacturing speed. A method of manufacturing a part by means of a laser beam, an electron beam, a plasma or an ion beam as a heat source, a heating material, and a method called a high-energy beam, speed manufacturing, is an important branch of the field of material manufacturing, the most common in the industrial field. In the aerospace industry, the rapid manufacturing of high-beam beams of metal, non-metallic or metal-based composites is the current. The fastest research direction. After 20 years of development, increased material manufacturing experienced from the bud to the industrialization, from the prototype display to the direct short-run additive manufacturing process, the development is very Swiftly. The Wohlers Associates, which specializes in the provision of technical support services to the United States, in the 2012 annual report on the application of the industry the analysis. In the past few years, aerospace parts manufacturing and medical applications are the fastest growing applications. 2012 capacity scale will grow 25% to $ 2.14 billion, and $ 20 billion in 2019. Material manufacturing technology is in the development period, with strong vitality, is still evolving with the development of technology, applications will be more and more widely. With Additive Manufacturing parts are built by melting thin layers of powder. Material is added instead of removed, as is the case in traditional machining. Each layer is melted to the exact geometry defined by a CAD model. 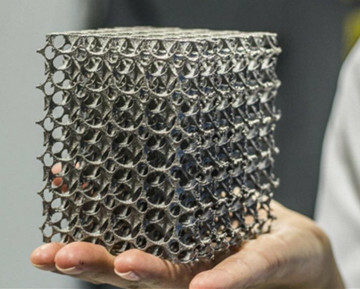 Additive Manufacturing allows for building parts with very complex geometries without tooling, fixtures and without producing any waste material. In addition to the freedom in design and cost-efficiency, Additive Manufacturing is, due to its high material utilization, an energy-efficient and environmentally friendly manufacturing route.